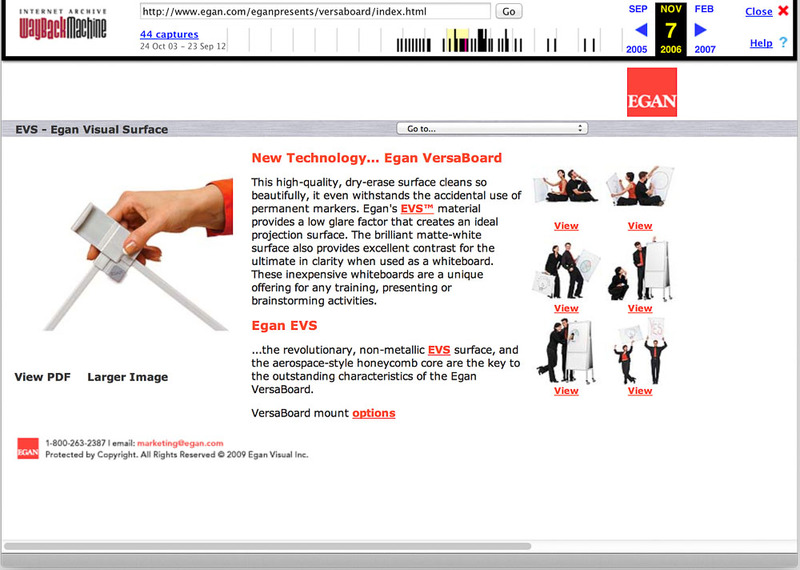 The bright colors used on the website in 2000 were now dated and a new product “EganSystem Metallic” led the brand to a very clean white look. The changes were largely cosmetic for the public views. The catalog was changing very rapidly and print brochures were where most of the effort focused. It was a very busy time for the Egan & TeamBoard. Global pressure and competition were fierce and a great deal of energy was pouring into new products, new markets in Europe, Australia and South America. The back-end resources for Representatives and Customer Service were also expanding rapidly. This link will discuss that side of the web site. The images of the site cover the “Metallic” version of the site from 2004 through 2011 and were pulled from the Alexa Wayback machine .